Extras Bundle includes quality Drum Stool, Bass Drum Pedal, Drum Sticks & Headphones. The updated TD-1KPX2’s innovative folding stand is durable, sturdy, and ultra-easy to set up it also now features a badd drum trigger pad that can accomodate a double bass drum pedal (pedal not included). All you need is a dedicated drum tuning key and you’re ready to play in seconds. Simply unfold everything, adjust the stand and pad positions, attach an acoustic kick pedal (not supplied), and start drumming. When you’ve finished your practice session or gig, the stand folds down quickly into a surprisingly condensed size for transport and stowing away at home in a corner, under a table, or in a closet. The folding stand can adapt to fit many spaces and situations, making the TD-1KPX2 a kit you can truly play anywhere. Built into the TD-1KPX2 module is a wealth of enjoyable functions to encourage learning, no matter whether you’re teaching yourself to play, studying regularly with an instructor, or simply wanting to keep your skills in shape. Think of this kit as your own live-in drum teacher and personal backing band, packed with tutorial features that develop technique, boost motivation, and help you get the most out of practice time. Play along with the onboard metronome to tighten your timing and use Coach mode to build and maintain speed, stamina, and accuracy. Get ready for your gigs or band rehearsals by jamming with the internal songs in the sound module, or connect a smartphone or music player via the Mix In jack and drum along with your favourite tunes. With the onboard recording function, you’ll get instant feedback on your progress. The TD-1KPX2 is not just fun to play by itself—it’s also a great way to make music with your computer. Included is a built-in USB-MIDI interface, making it simple to communicate with music software via a USB cable, with no extra hardware needed. * Maybe you’ll transfer your playing into your computer-based recording software, capturing a live drum feel in your latest masterpiece. 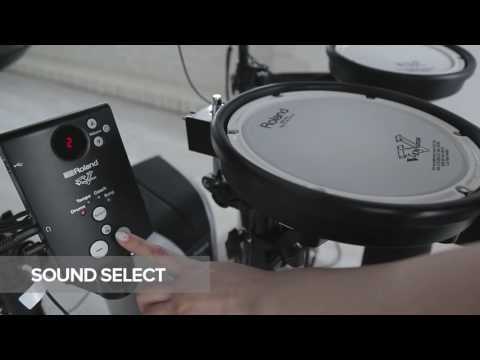 Or perhaps you’ll use Roland’s free V-Drums Friend Jam series applications, which offer jam tracks, practice features, and the ability to compete with V-Drums users across the planet. Whatever application you choose, the TD-1KPX is a drum kit that lets you go places.